Need a moment to yourself? Here's an easy and fun distraction, er...game, for your child to play on his own! 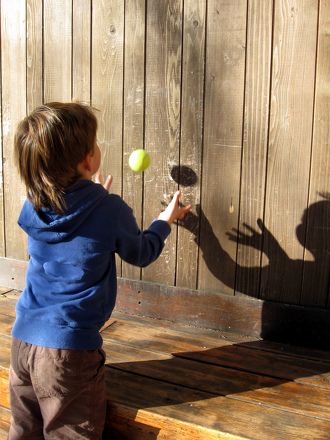 Using just a tennis ball and an empty wall, your child will perform seven rounds of moves before catching the ball. But be careful - if he drops the ball, he has to start all over again. Your child will have a ball challenging himself in this fun one-person game to complete all the twists, jumps, and claps! He'll also get to practise his throwing, catching, and hand-eye coordination skills! Search in and around the house with your child for an empty wall. A wall with hardwood flooring or concrete underneath are ideal for bouncing. Invite your child to stand a comfortable distance from the wall. When starting the game, being closer to the wall is better. As the game goes on, your child will figure out how to adjust the distance for each task. Onesies: Throw the ball against the wall and catch it before it bounces. Twosies: Throw the ball against the wall and let it bounce one before catching it. Do this step twice. Threesies: Throw the ball against the wall and clap before catching it. Do this step three times. Foursies: Throw the ball against the wall, spin around, and catch it after the first bounce. Do this step four times. Fivesies: Throw the ball against the wall, clap twice behind your back, and catch it. Do this step five times. Sixies: Throw the ball against the wall, bend down and touch the ground and catch it. Do this step six times. Sevens: Throw the ball against the wall, jump and clap hands once in front of you and catch the ball. Do this step seven times. If the player drops the ball, he has to return to the beginning of the seven rounds and start over. The pressure to get it right increases with each round, making the player's focus and attention increase as well! Once all steps have been completed, he wins! 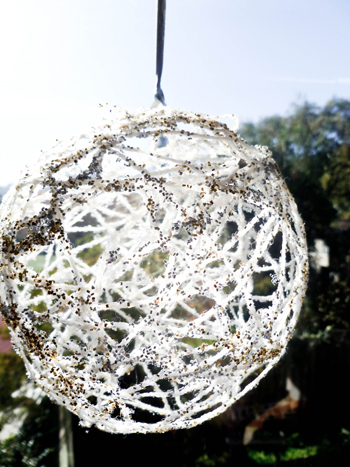 Your child will jump at the chance to get messy (under adult supervision, of course) with this project and create some unique home decor that really shines! Mastering subtraction is a lot like mastering baseball - it takes practise. Students can practise their subtraction skills by using the regrouping method. Test your child on her times tables knowledge, and practise multiplying by sevens with this times tables practise sheet. To find out what nocturnal animal is hiding in connect the dots worksheet, count by sevens to complete the picture. Count by sevens to connect the dots and complete the picture. This coloring page dot-to-dot provides unexpected maths practise with a fun activity. Basketball Coloring Pages for Kids! 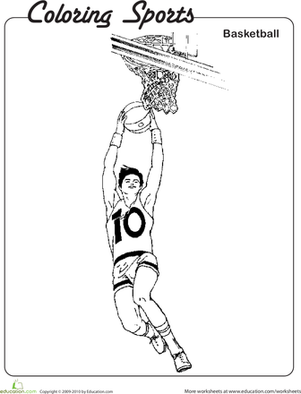 This coloring page features a basketball star on his way to dunking the ball into the net.